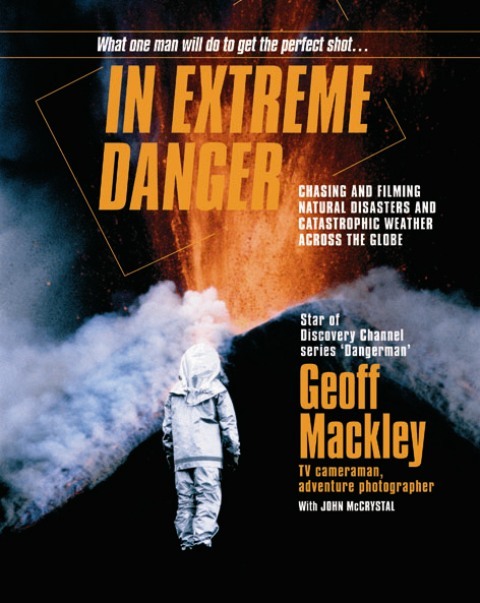 New Zealand-based cinematographer Geoff Mackley has carved out an international reputation as a film maker and photographer of natural disasters and catastrophic weather events in all parts of the globe, from Florida to Siberia. With death-defying courage, he has photographed erupting volcanoes (and abseiled into them), deathly tornadoes, hurricanes, supertyphoons and severe tropical cyclones, and been first on the spot to film the terrible toll of tsunamis and earthquakes. His film footage regularly leads news broadcasts on global TV networks, and his incredible exploits have featured in his Discovery Channel series Dangerman. Now, for the first time, he tells of his remarkable life – from growing up in New Zealand to becoming an international TV star – and the stories behind his famous photographs. Mackley was a featured speaker at the 2005 international television market in Cannes. In New Zealand he has been the subject of a 60 Minutes documentary, featured on Eating Media Lunch, and been interviewed by Kim Hill.